Residential and commercial building thermal imaging surveys in accordance with BS EN ISO 13187 and BRE 176. Thermal imaging building surveys provide a non-destructive assessment of a buildings thermal performance. Once captured, thermal imagery allows for the quick identification of problems associated with heat loss or gain. This data can be used to clearly indicate areas of missing or damaged insulation, air leakage or moisture ingress. The data we collect on-site is assessed by one of our PCN Category 2 accredited thermographers, providing actionable and definitive evidence tailored towards your requirements. Pairing thermal imaging with specialist equipment such as damp meters and remote data loggers enables us to produce a wide range of bespoke reports, tailored for every situation. It’s possible to be awarded a BREEAM credit by conducting a thermal imaging survey of the building fabric by a qualified PCN Category 2 (or approved) thermographer. What can thermal imaging detect? Detect and accurately locate inward or outward air leakage caused by cracks and unintentional openings. Assess the probability of damp and mould using advanced thermal indexing methods. iRed are a preferred supplier for NHBC and a number of national builders throughout the country. 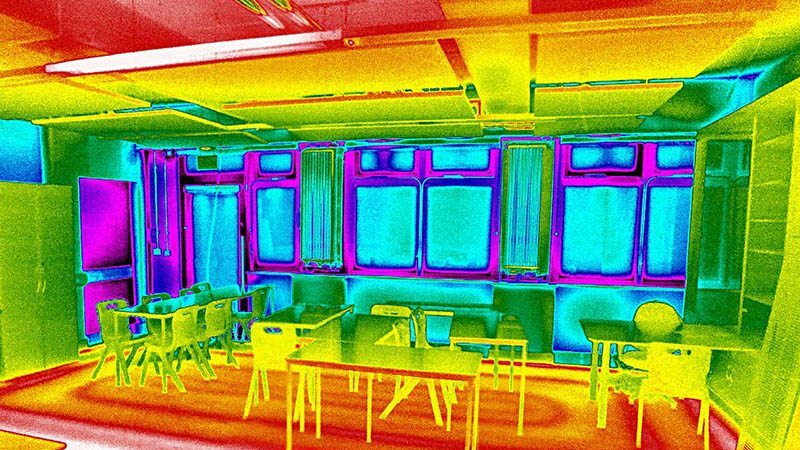 Thermal imaging surveys provide a non-destructive assessment of a buildings insulation, highlighting areas of missing, damaged or inadequate insulation. Our approved drone pilots can quickly discover air leakage and heat loss on roofs. Quickly identify and map underfloor heating for remedial works with a heat loss survey. Oversights or differing standards at the time of construction may have left areas uninsulated. Repurposing of buildings or parts of buildings – such as incorporation of a lean-to cattle shed into an extension – may be particularly vulnerable to design deficiencies. Builders may not have actually included and properly incorporated insulating features according to the design, due to forgetfulness, lack of skill or desire to save on material costs. Remember that the builder is seldom the person who will be affected by such omissions. Unintended actions such as lumps of falling mortar within a cavity may have damaged insulating materials; examples have been noted where discarded drinks cans have been left within the structure of the building, compressing insulation. This can range from squirrels damaging roof insulation, to the unintended or careless disturbance of insulation during subsequent building works such as the building of an extension or the addition of dormer windows. Some insulation types, particularly older materials, are vulnerable to damage from water ingress, or may break down naturally over a long period of time. Where a temperature difference exists between the internal building temperature and ambient temperature, such defects in continuity of insulation will be manifested as thermal bridges, and are therefore detectable using thermographic imaging. Our accredited thermographers are some of the few able to undertake thermal imaging surveys for housing developments and new builds, specifically in accordance with the new BRE Home Quality Mark Technical Manual – SD232:2015. The Home Quality Mark (HQM) is a national standard for new homes, which uses a simple 5-star rating system to provide impartial information from independent experts on a new home’s design, construction quality and running costs. The mark was developed by BRE, and is part of the BREEAM family of quality and sustainability standards. The test and inspection of the integrity of the building envelope is carried out post-construction. This includes the quality assurance of continuity of insulation, avoidance of thermal bridging and air leakage pathways. Once the report has been delivered (5-10 days from the date of survey), it’s then passed onto your Home Quality Mark assessor who will submit it as part of your Home Quality Mark application. 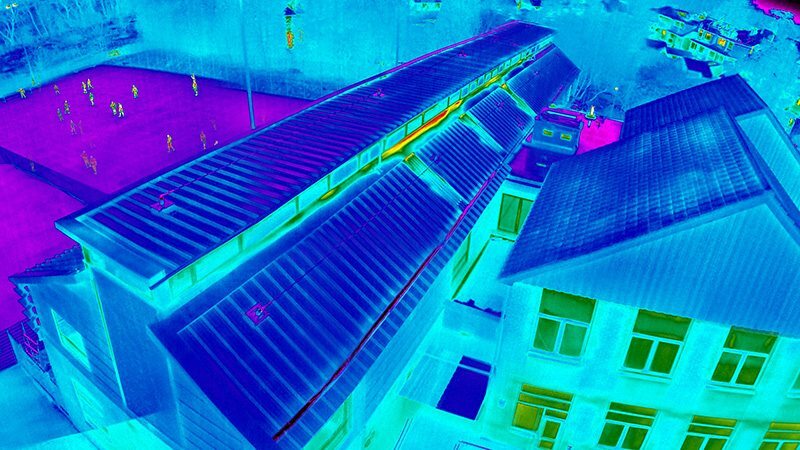 Aerial thermal imaging is the perfect solution for assessing roofs to accurately detect and locate areas of missing or damaged insulation. Our drones conduct technical inspections using specialist, purpose-built thermal imaging cameras that are designed for surveying roofs, large buildings and wide areas. iRed holds Permissions for Commercial Operations (PfCO No. 2082) from the Civil Aviation Authority (CAA), meaning our pilots abide by any laws and suitability’s set out by current UK legislation. In situations where environmental conditions exceed safety parameters, we operate a 102ft vehicle mounted mast capable of surveying wide open spaces and structures 7 stories high. BREEAM (Building Research Establishment Environmental Assessment Methodology) is a structured methodology to analyse, rate and certify a building’s environmental and sustainability characteristics. In the latest BREEAM UK New Construction 2014 technical manual (SD5076) it is possible to be awarded a BREEAM credit by conducting a thermal imaging survey of the building fabric by a qualified PCN Category 2 (or approved) thermographer. 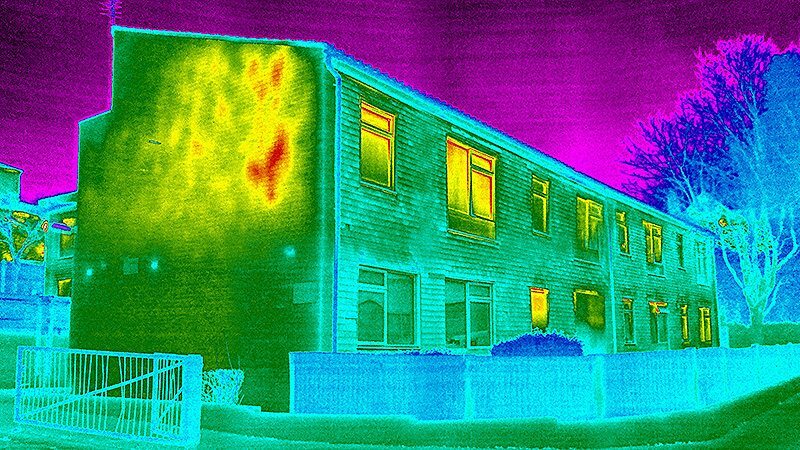 Using high-resolution thermal imagers to assess surface temperatures enables us to locate paths of air leakage, establish energy losses and optimise energy efficiencies for building applications. 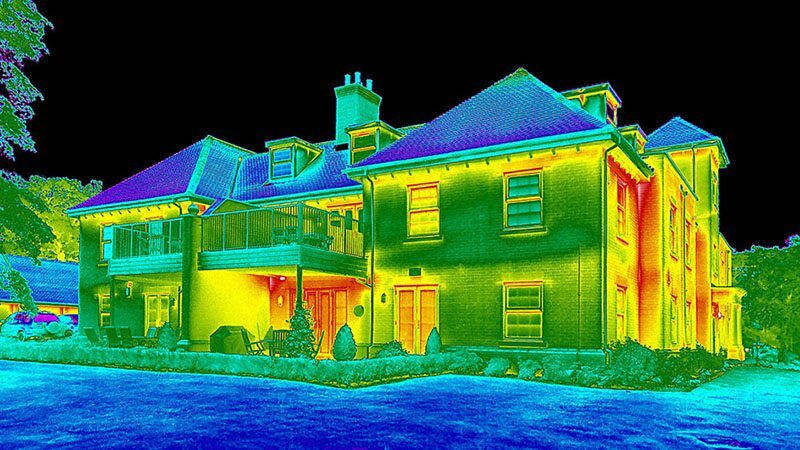 iRed offers thermographic surveys specifically tailored to meet the requirements of BREEAM, which could lead to a credit towards overall BREEAM certification. Our accredited thermographers have carried out hundreds of building thermal imaging surveys across the UK, all of which have contributed towards achieving a BREEAM credit. iRed have conducted housing stock surveys for several councils and housing associations such as Croydon, Kensington and Richmond Council, where we have surveyed thousands of properties using expert thermal imaging reporting software to produce a detailed and accurate report for each. 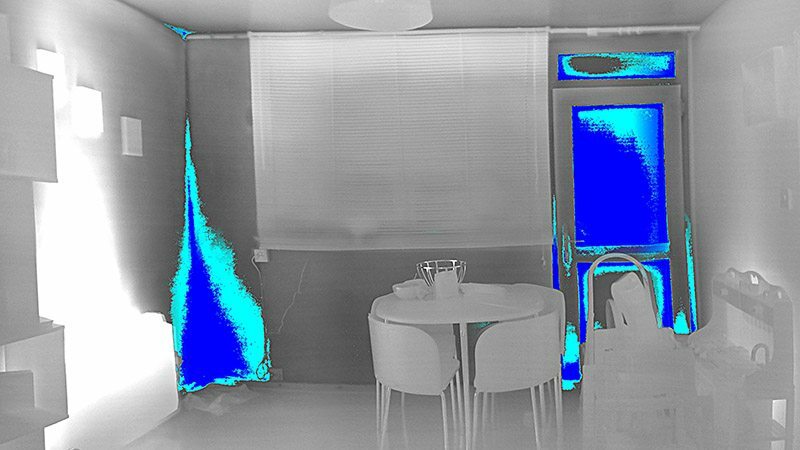 Thermal imaging housing stock surveys focus on providing a brief external snapshot for a wide range of residential properties. As these surveys only assess a buildings exterior, they provide an economical solution to undertaken multiple heat loss assessments. The following are thermographic survey requirements for building inspections in accordance with the recommendations of BS EN 13187:1999. As such, if any of the conditions below are not met before undertaking a thermographic survey, the conclusions and outcomes within our reports may not be fully accurate or actionable. To ‘see’ heat loss (or gain) at least a 10°C temperature difference between the inside and outside must be achieved for a minimum of 24 hours prior to the survey if occupied, or 72 hours for a ‘dead’ building. If the building has no operational heating system, temporary direct heaters (such as space heaters) may be required. Prior to the start of a survey, building surfaces must be dry so that artificial cooling from moisture evaporation does not skew the results. For heavy building fabrics such as brick it’s highly recommended that the surface has been dry for at least 24 hours. For lightweight buildings, a minimum of 12 hours is recommended. Full access must be granted before any thermographic survey in order to analyse external elevations from inside of the thermal envelope. The building fabric must be kept free from obstructions such as furniture and building materials, as we cannot move anything during the survey and it takes at least an hour for the local temperature conditions to stabilise. Building surfaces must be free from solar radiation for a ! minimum of 2 hours prior to the start of the survey – longer if the building consists of a heavyweight fabric. This is to allow for the effect of external heat gain in the wall to dissipate. Typically, surveys can be expected to start at 00:00 during summer and 20:00 during winter. The wind speed during the survey should not be greater than 5m/s (18kph). This is in order to stop the cooling effect from exceeding recognised compensation values. A detailed thermal imaging report outlining any potential thermal anomalies or issues. Advice and recommendations from a BINDT accredited PCN Category 2 thermographer. Once your report is delivered, we’re on-hand to answer any questions you may have. We’re proud to maintain a number of accreditations, certifications and affiliations with national and global organisations. Fill in your details below and recieve a free quote today. Our telephone lines are open Monday to Friday, 9am to 5pm. Get in touch and we can arrange for one our specialists to visit you for a face-to-face meeting.